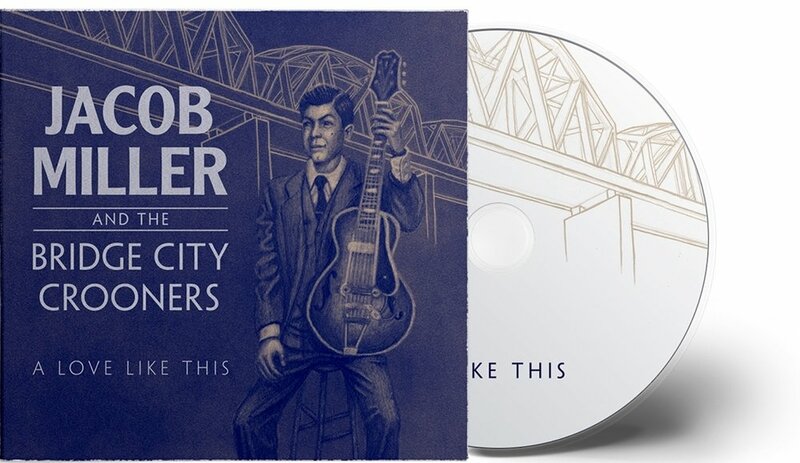 Jacob Miller and the Bridge City Crooners is a Portland-based Americana band that gives new life to the sounds of the 1930’s and 40’s. I designed the packaging for their second album. When Jacob Miller hired me to create the album art, he had a pretty clear idea of what he wanted. He sent me images of old jazz and blues records, as well as a photograph of himself with his guitar. He wanted to include a bridge as a shout-out to Portland, Oregon, the band’s stomping ground. While the old-timey look was definitely appropriate to the style of music, I also wanted to add a contemporary touch. One way I did this was to have the most important part of the image (Jacob) fully rendered, while leaving the secondary element (the bridge) a line drawing. I thought the line drawing of the bridge worked nicely as a device to navigate the viewer between the type and the figure, which I worried would look stagnant and disjointed by themselves. Its diagonal orientation broke up the picture plane and create a sense of depth, while its minimal detail kept it from distracting from the foreground. Typography was another crucial factor in the attempt to harmonize the old-timey vibe with the new. After auditioning a long list of slab serif typefaces, what I thought would be a graphic-yet-throwback look turned out rather contrived and far too Wild West. I settled on Clearface Gothic for the “Jacob Miller” portion because I liked the way it sat heavy, like a bold sans serif would, and yet had subtle, organic-looking serifs that harkened back to the early 20th century. I found Penumbra Sans to be the perfect complement to Clearface Gothic because it had all the features I was looking for in a contemporary sans serif (tall x-height, sharp corners, and large, round counters), and its weight and angularity complemented the soft, heavy quality of Clearface Gothic. By using all caps, centered alignment, and dividing rules, I was satisfied with how the type worked together as a cohesive unit and embodied the old-yet-new look that I was after. The process for the back cover was very similar to the front. I received a sketch of a layout featuring portraits of each band member labelled with old fashioned flags. I rendered the portraits in powdered graphite again, but choose to merely outline the shirts as a way to mimic the relationship between the foreground and background on the front cover. For the disk itself, I decided on solid white for a visual rest amongst all the texture on the covers. I included just the album title and a line drawing of the bridge to give it a clean, graphic finish.